Active-Semi adds ACT88430 to its power management portfolio with increased efficiency and reduced output voltages down to 0.6V covering present and future processor solutions. DALLAS--(BUSINESS WIRE)--The ACT88430 is the next generation ActiveCiPSTM Power Management IC combining seven fully integrated power channels with one 4A buck regulator, three 2.5A buck regulators and three LDOs with digitally controlled features providing seamless and easy sequencing, adjustable protection features, four highly flexible GPIOs and a dedicated external power converter control pin. The buck converters support DVS (Dynamic Voltage Scaling) with 9.375mV steps down to 0.6V and can be controlled with the I2C interface to optimize individual processor performance. The ActiveCiPSTM line of products allows system designers to change the power up and down sequencing, output voltages, current limits and many more parameters by using the IC’s proprietary multiple-time programmable logic to meet changing requirements during product development without the need for changing the PCB layout. It also enables the reuse of the same power management solution in follow-on designs with different voltage and sequencing requirements. 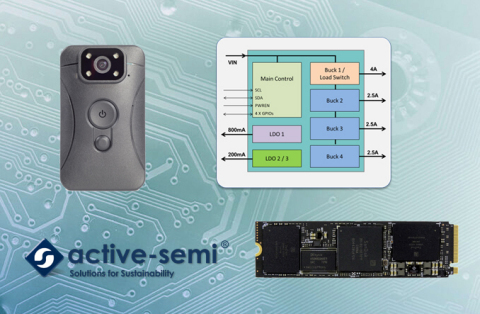 Founded in Silicon Valley and headquartered in the Dallas, Texas metroplex, Active-Semi is a rapidly emerging leader in the multi-billion-dollar power management and intelligent motor drive IC markets. The company’s portfolio of analog and mixed signal SoCs provide scalable core platforms used in charging, powering and embedded digital control systems for industrial, commercial and consumer applications. Active-Semi offers Power Application Controllers® (PAC®) and ActiveCiPSTM programmable analog ICs that significantly reduce solution size and cost, improve system reliability, and shorten system development time.